SAN BENITO — Police Chief Michael Galvan made eye contact with three suspicious individuals who were walking in an empty field near a home that had just been burglarized. They were carrying a black duffle bag. Galvan was in the area assisting McAllen police on another investigation in the 100 block of Wild Olive. “I just happened to be at the right place at the right time and our police instincts kicked in and we did what we had to do,” Galvan said. Galvan sprinted for nearly two blocks from where he spotted the suspicious individuals running when he got a hold of one of the suspects. Galvan summoned aid from a bystander named Pedro Rodriguez to help take him into custody. Another suspect was located hiding under some hedges at a nearby apartment complex. Police said it was revealed the suspects had just burglarized a residence in the 200 block of Corona Crescent. Police said the black bag contained $4,000 worth of assorted jewelry. That jewelry was special to Frank Garza, whose house had been ransacked by the suspects Galvan had just caught, according to police. Garza said the items were those of his late wife. She died three years ago. A longtime resident of the neighborhood, Garza said he was impressed with the department’s effort and ability to find the suspects so quickly. “They did a beautiful job and they deserve credit,” Garza said about the chief and officers involved. Earlier in the day, Garza had come home after work to find his front door wide open. The thieves had entered through a window in the back of the house where they pulled out an air conditioning unit. His house was a mess and his first thought was the whereabouts of his cat. One day later, Garza was appreciative of the police, who quickly resolved his situation and returned his wife’s jewelry. Marcelino Macias, 17, from San Benito is charged with burglary of a habitation, $50,000 bond. Macias was also charged with failure to identify, a Class A misdemeanor, $10,000 bond and two outstanding warrants for assault, Class A, police said. His bond was set at $50,000 on each count of assault with a total amount of all bonds at $160,000. 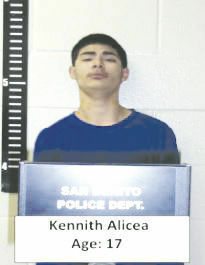 Kenneth Alicea, 17, from San Benito was charged with burglary of a habitation, a $50,000 bond, resisting arrest, $15,000 bond, and evading arrest or detention, $15,000 bond. Both suspects were arraigned yesterday by Judge Benjamin Yudesis, and committed to Cameron County Jail. The third suspect got away, but has been identified, police said.